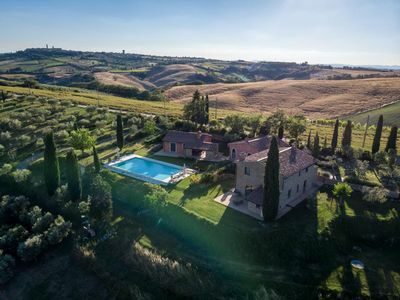 The estate Poggio ai Gelsi is located in the south of Tuscany between the hills of Val d'Orcia, Siena and halfway between Montepulciano and Pienza. 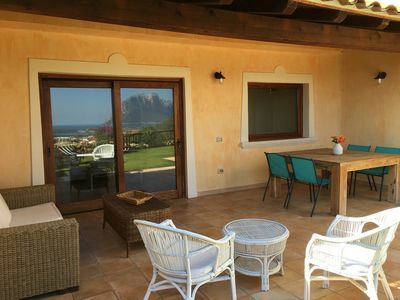 The property enjoys a magnificent view over Montichiello and Pienza. 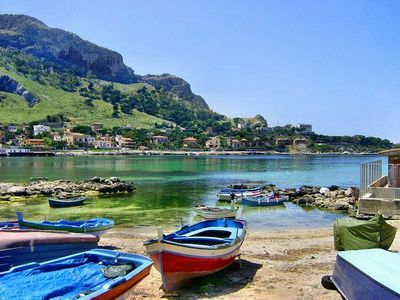 The colours of the nature in this corner of Tuscany are beautiful and change day after day, with different nuances. Various shades of green, yellow ocher, grey, charcoal and so much more ..... a show! 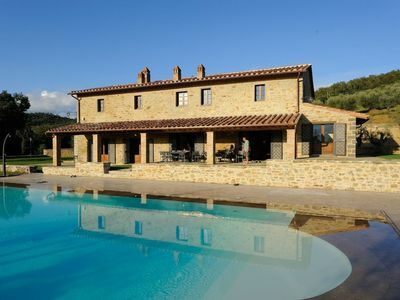 We are in Val D' Orcia near Pienza, the typical Renaissance city, a UNESCO world heritage site. 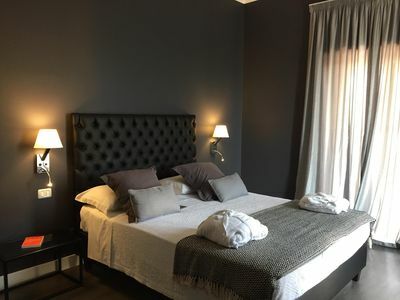 Its surroundings are Montepulciano and Montalcino, two cities and lands of great wines; Bagno Vignoni, Bagni San Filippo and San Casciano dei Bagni, are places with thermal spring and of great interest. 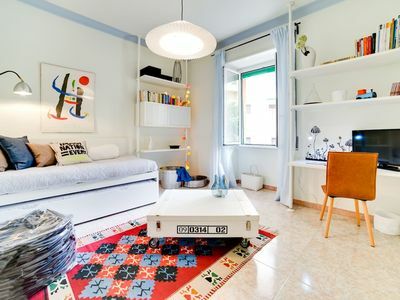 Arezzo, Siena and Perugia are close together so you can make a vacation complete with art, culture, nature, food and wine all at your fingertips. 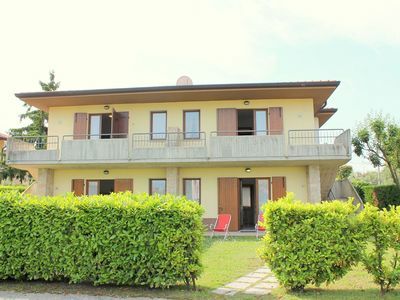 The estate Poggio ai Gelsi is comprised of three buildings: the main house in stone, closed at the moment, and two lodges that offer accommodation in three housing units. 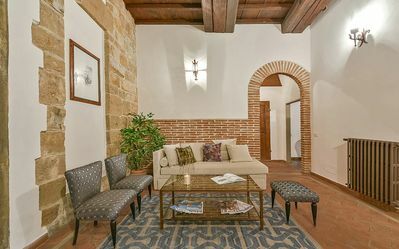 The buildings have been restored taking care of every detail while maintaining the traditional Tuscan features: exposed beams and terracotta floors. The furniture consists of a few pieces of antique and modern furniture. 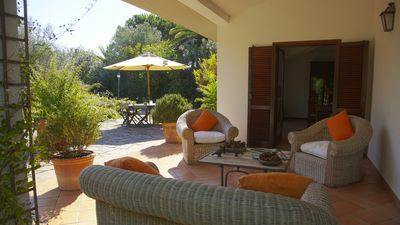 The large outdoor area offers several quiet corners where everyone can find their favourite place to relax and enjoy the nature...a beautiful paved square garden with fruit trees, cypresses and olive trees and the beautiful infinity pool that is located on the centre of a natural terrace overlooking the valley. 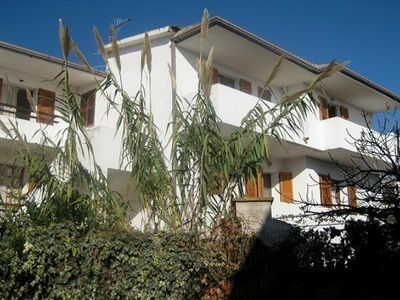 On the right side of the cottage centrally located is the apartment Melograno. 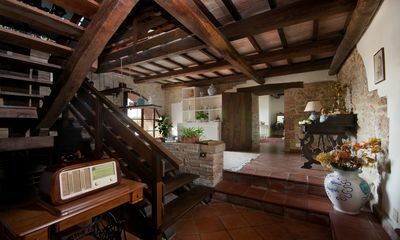 With a few steps you reach the living room with kitchenette, dining table and sofa with fireplace. 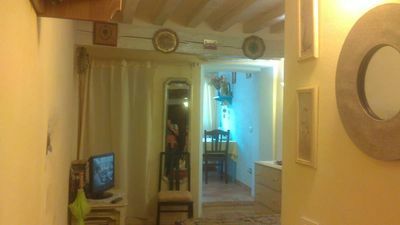 A small hallway with closet leads to the bathroom and to a double bedroom with satellite-TV. 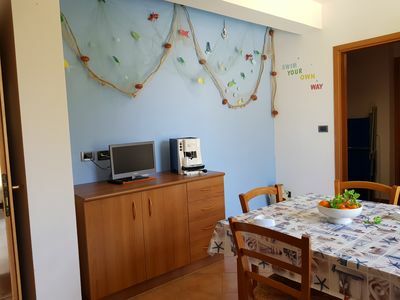 Accessories: Sat-TV, Wi -Fi, oven, 4 burner gas cooker, fridge with freezer, Mocha, citrus juicer, coffee maker, toaster, mosquito nets (except the front door), hair dryer, washing machine in common use in the technical room of the swimming pool, BBQ in common, 1 cot and 1 highchair in common use. The large outdoor area is partially enclosed by the access. In front of the entrance gate there is a parking area. 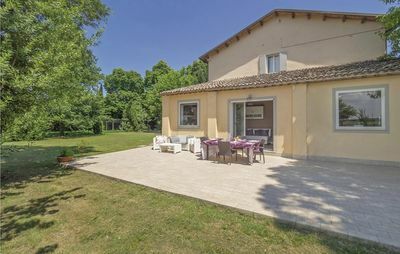 The garden extends around the houses; one of the houses is a large attractive square with terracotta floors and a fountain surrounded by walls made of local stone. The surrounding nature invites you to go for walks, mountain biking or horseback riding. 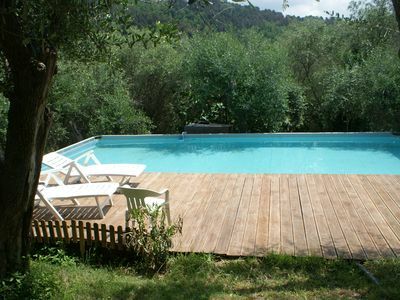 The infinity pool with mosaic from a Roman staircase and entrance is in front of the houses on a natural terrace which overlooks the valley. The pool measures 7 x 14.3 meters and the depth ranges from 1.20 to 1.50 m. The pool is opened from the last saturday of April to the first saturday of October. - Intermediate cleaning: once per object Costs amounting to 45 EUR (optional). - Final cleaning: once per object Costs amounting to 45 EUR (Mandatory). 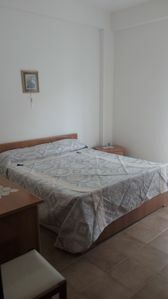 - change linen: per person and week Costs amounting to 10 EUR (optional). - 5 € for cubic meter gas: per person and week Costs amounting to (optional). - pool towel: per person and week Costs amounting to 3 EUR (optional). 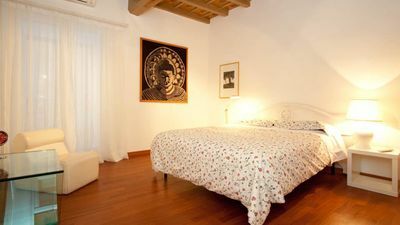 Apartment very large and bright close to the Trevi Fountain and the Spanish Steps! 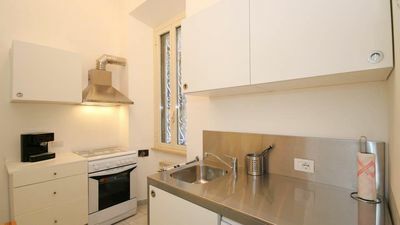 Agnese In Agone,Apartment with excellent price to twenty meters from Piazza Navone! 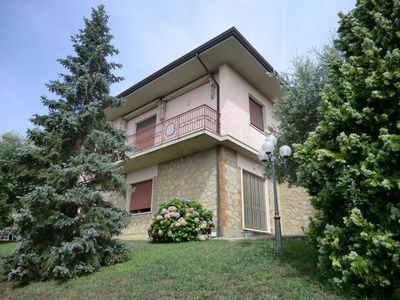 (Text automatically translated) house on a hill in a quiet area, near cities' art florence km 90 km 22 km 20 Pisa Lucca-Viareggio 10 km motorway entrance 12/A11 nearby.